As I sat on the bus and fell into my usual habit of staring out the window and thinking, I wondered if I had unconsciously taken on some kind of bias. Why should a drama always signify war zones or shoot-em-ups? Why, when it enters the (historically feminised) realm of the family should it be classified as a different type of drama? I made a note not to use that phrase again, particularly as I’d offered to review this book for the Australian Women Writers Challenge when I got talking to Jan Zwar (who knows the author, Jane Messer) at a conference. One of the aims of the AWW Challenge is to redress the tendency to overlook writing that is written by women, or may have feminine subject matter. 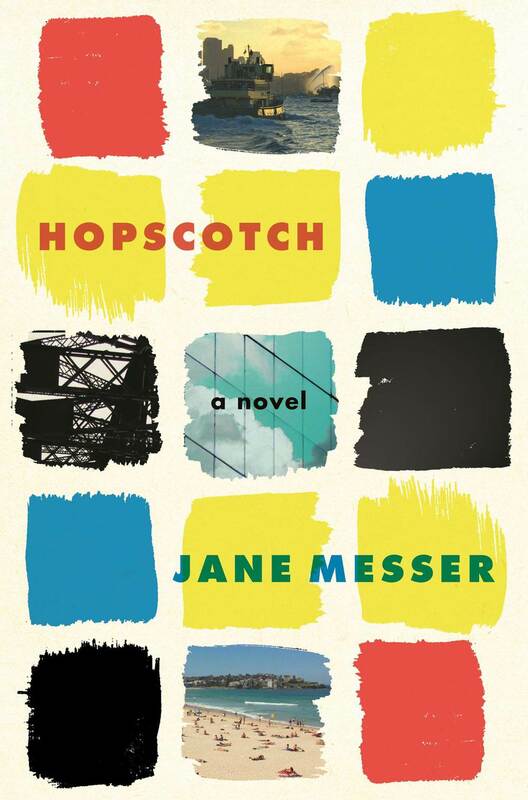 The drama in Hopscotch comes not from car chases, but from the tension in the Rosen family. The Prologue finds them gathered around the table for Sam, their father’s, birthday. Already there is bickering, tentative singing, forced jollity, tears and shouting, while the opening line, ‘Hours before the spring winds crashed through, the sash windows rattled only a little’ signals the disorder to come. The novel then backtracks to four months earlier and follows the lives of the three Rosen children, Mark, Jemma and Liza. Mired in debt as the GFC hits, Mark and his marriage begin to crack with strain. Jemma, a new resident of Redfern, finds her stereotypical assumptions of Aborigines are challenged when she becomes the victim of crime. Liza is desperate for a child, which doesn’t look like it’s going to happen with her current boyfriend. This is a middle-class family, dealing with the everyday concerns of mortgages and relationships in Sydney. The strength of the novel lies in its detailed rendition of how the characters negotiate their daily lives, buffeted by the unpredictable forces of illness, desire, violence and financial markets. Although there was so many people in the Prologue that it took me a while to work out who was who, and I found the metaphor of Jemma pleading with her family to harmonise the tune of ‘Happy Birthday’ somewhat forced, I was soon pulled into these characters’ worlds. Each person was well-drawn and consistent, and the push-pull of their relationships was believable. Sam, edging towards death with cystic fibrosis, is apathetic with tiredness, much to his wife’s frustration. Life doesn’t stop when one becomes sick, and Rhonda, impatient, arranges for them to sell up and move. The use of focalisation (of narrating a character’s thoughts in third person), is excellent: ‘He would always be out of reach; she would never be able to repair him or love him or make him well again. She couldn’t stand him … In the kitchen, the boiling kettle whistled. She would make him tea’ (213). Neither does life stop for Mark, who is crushed by the debris of falling markets. His paranoia, then full-blown terror, over losing his job is mesmerising. Up to his neck in debt, panicking about how to find money for his wife and potential child, he becomes deluded and resentful: ‘He was going to be sacked in the morning, Ingrid was on the lounge resting and not working to save their financial arses, and he was going to struggle to get the funds for the Dee Why deal’ (275). Ingrid is irritating, with her nose constantly in pregnancy magazines, but she rallies when disaster strikes. While Mark’s life falls apart, the sisters’ lives knit slowly and surely into something stronger. Jemma, uptight, neurotic and recently moved out of home, is traumatised by violence but released into the delight of a new relationship. Liza, after dating a string of deadbeats, slowly becomes more secure through managing a childcare centre. I loved the administrative details of her job and her placation of fractious parents, maybe because I'm obsessed with order myself. When the novel finished, I was disappointed that I couldn’t read anymore of the characters’ thoughts about childcare, the cloud, or the invasion of online privacy. I wanted to stay involved in their lives, and kept thinking about them for a week afterwards. Usually, for me, this is the sign of a good book. Yet, while Hopscotch is an undeniably enjoyable read, I also found the plot frustratingly formless and I wanted more ideas to mull over. I couldn’t get much more from it that the notion that people must always deal with the stressors and unpredictability of life regardless of how well-off they are. This aside, if you’d like an engaging snapshot of middle-class relationships in Sydney’s mid-noughties, with drama aplenty to keep you turning the pages, play Hopscotch and you’ll find yourself having fun! This is my third review for the Australian Women Writers Challenge. If you'd like to subscribe to these posts and other updates, you can sign up here.